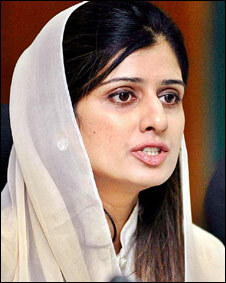 The government has decided to elevate State Minister Hina Rabbani Khar to foreign minister. A source told Pakistan Today that President Zardari and the PM had decided in principle to elevate Hina so as the strategic dialogue process with friendly countries, including the US and the UK could go forward. The source said a formal announcement would soon be made in this regard. Born on 1977 in Multan, Hina Rabbani Khar is the daughter of Ghulam Noor Rabbani Khar and niece of Ghulam Mustafa Khar who are good politicians. Hina Rabbani is a popular Pakistani member of parliament, affiliated with the PPP. In 2003 to 2007, Hina Rabbani Khar served as the State Minister for Economic Affairs and Statistics as National Assembly member of PML-Q. In 1999, Hina done B.Sc Economics from Lahore University of Management Sciences and went on to earn a M.Sc. in Management from the University of Massachusetts in 2001. She was named to the World Economic Forum’s list of young global leaders in 2008. Hina Rabbani was elected as a member of National Assembly with a ticket from PPP from the constituency of Muzaffargarh, Punjab.